Mo money, mo money, mo money. 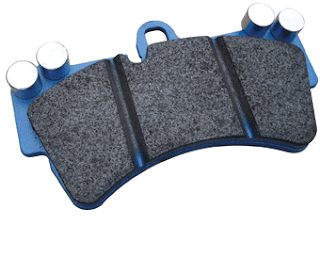 Well, since my pads are done, I've gone with my gut and ordered a set of EBC Blue NDX pads. The yellows never failed me performance-wise but their longevity was abysmal. I spoke with a tech over at EBC and we're looking at the Blues as a potential solution. They're only $10 more than the yellows ($170) and I had a gift card from Amazon for $10 so I basically got them for the same price. If they last until the end of the year, I'll be happy. I plan on toning down on my events to save some more cash. I'll be transitioning to a more general informational and entertainment tone in videos. But be on the lookout for some 0-60 testing videos, a trip to the drag strip? (Finally) and I'll continue to run autocross events. I'll continue working on my line and lap times and have some raw footage for those who've asked for it. Right now though, I do need some suspension upgrades and I'll be picking up another car by the end of the year. Injector Dynamics ID1000 have been the favorite of many Evo owners and what I would have gone with, but they were out of stock right before I was about to get to Cobb Tuning Plano to get tuned. How many BMWs can you pass in 15 minutes? How to make a grilled brake sandwich or EBC Yellow stuff brake pad review. 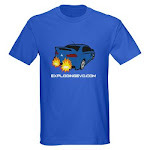 Take four EBC Yellow brake pads and repeatedly apply large amounts of heat. You should then have a nice crisp brake sandwich in approximately 6500-7000 miles. I picked up the EBC Yellow Stuff brake pads back in November before a track day. They had been recommended by several people and I looked forward to installing these pads. The day before an HPDE I had to get them on and hopefully bed them. Well, I managed to get everything done just in time and the pads felt a little weak in the first session, but by the second they felt great. However my car was another story. Issues with fuel delivery cut my day short. All in all I probably only got in about 15 laps. The front pads are done. So these pads have survived maybe... 40 actual laps on track. And about 6,650 miles of daily driving plus at least 20 semi-spirited drives (rarely track level braking). I'm going to say that I'm disappointed in the longevity of the pad, the life was a bit short. As far as reliability: when using the pad at Harris Hill Road I was able to handle braking with no problem and never felt like I had fade in 20 minute sessions. When driving on the street, there was maybe a squeak my first stop sign and after that the pads didn't make a peep. They were perfect for what I used them for. If only they had lasted a few more months. I've been recommended several other pads including PFC 06 pads as well as the Raybestos ST43's. Not sure what the plan is yet, but I do have some other problems. My CV axle boots are leaking at the rings which means I'll need to find some boots for those or possibly replace the axles altogether. Not looking forward to that. I have some brembo pads that will suffice for driving for a couple months, but they won't handle track use for more than a day I'd wager. Too bad I didn't win megamillions. Well, the injectors are on the way. Picked up some new ID1000s. Hopefully we'll fix that fueling issue. 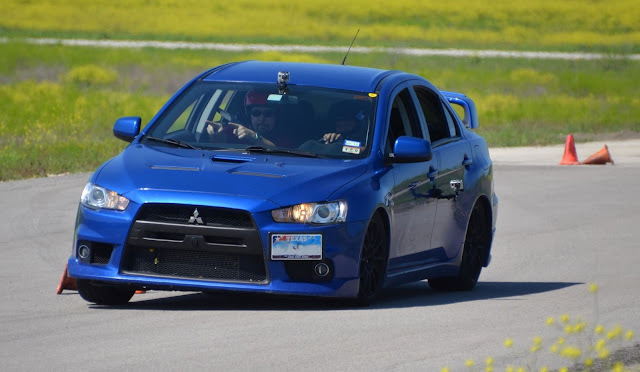 I competed in the Outlaw Autocross this past Saturday at Harris Hill Road, and it was definitely a blast! However the injector issue popped up again and the car's misbehavior severely limited my ability to accelerate :( I could use about 3/4 throttle at the straights and the car felt ok, but anything more would cause a lean condition. Still, I ended up 17/60 so, considering my level of experience, I'll call that a win. I'm ordering new injectors pretty soon here :( This was a smooth run though! Enjoy! Hadn't done any hard launching in a while and wanted to run a quick test. Tires weren't very warm and hadn't checked the pressure really.... but meh... a little better than before. Still spun quite a bit off the line. I think I could do better with a smoother launch. I picked up some new street tires! 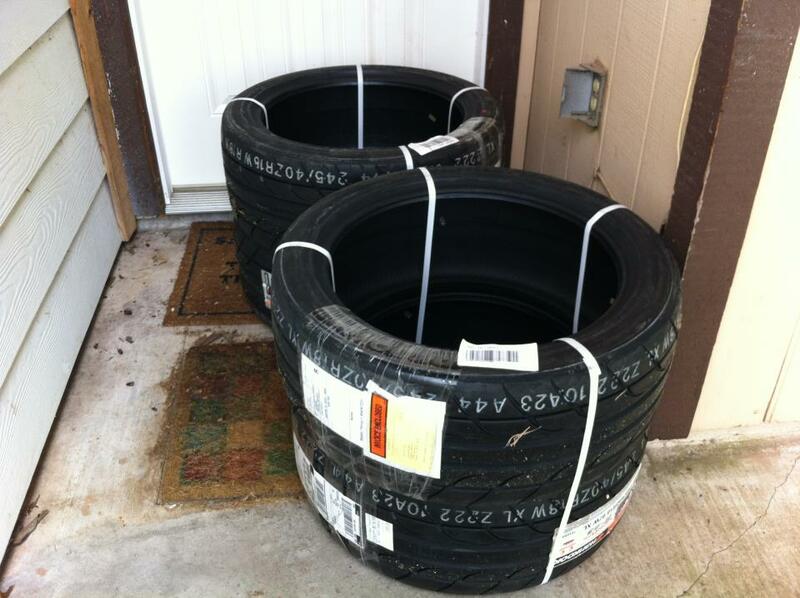 :) Getting ready to mount the tires this week for autocross events coming up at Harris Hill and at San Antonio Raceway. So a friend of mine put together a group that helped us get a discount joining Harris Hill Road I debated for a couple weeks and ultimately decided I couldn't pass up the deal. So Sunday, in the pouring rain, I made my way down to San Marcos and put down the cash to get in. I then proceeded to get as sideways as possible on the track, and even had a little unintentional rally action (just pulling myself out of the mud after a couple spin outs). My good friend was on hand to get some external video. Although she had some issues with the focus or something on the camera. Here's a cut of some of the drifting. I've decided to do autocross and met with the Spokes people in San Antonio for my first and last event competing as a novice. Then the following week I hit up the SASCCA and took 1st in Novice there too. Even with track experience, autocross is a completely different experience. The car is constantly being tossed around, and with stock suspension and my daily driver tires (which are apparently almost dead), my car feels like a cow in a shopping cart. Not sure if I'm going to try to compete in Tire class or what. I'll probably double enter so I get double the runs and more experience. Well I was asked to shoot a video with Cobb so they could showcase their exhaust system. After spending all last Tuesday working on things, we came out with this. On my trip to Abu Dhabi I was originally planning on driving the Renault Clio around the track in their... cheap driving experience. I showed up on Friday to sign up for the following weekend. Once onsite I found out that they didn't have any more spots available, AND if I wanted to drive I had to fork out the extra money to drive the Formula Yas 3000 car and I would be driving in 30 minutes!!!! Well, I rushed down to the racing school and handed over the money. The experience was OUT OF THE WORLD! Please see tell me what you think of the video I put together showcasing one of the most amazing events of my life. One thing... I wish I had worn different shoes. Oh yeah and a guy spun out in front of me. Shut down the track for 20+ minutes we sat in the cars baking in our race suits, then went back out for the rest of our session. Totally worth the ~$350. I really enjoyed the Nissan Meet. Lots of awesome cars racing. So Abu Dhabi was pretty fun, saw lots of nifty cars, and got to drive the Yas Marina Circuit. That was awesome.